Most of the time, beaders just work on loom or off loom projects. But why not both? 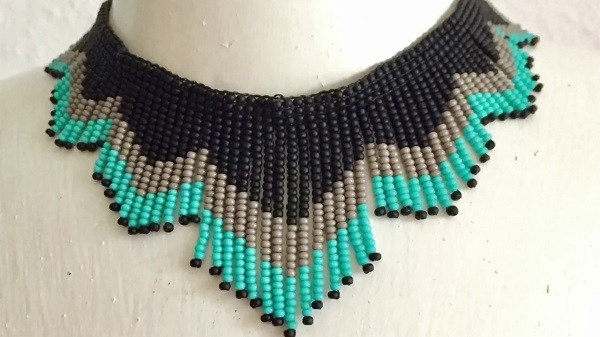 This necklace tutorial shows just how. The loom portion is the top of the necklace which is worn like a choker. The fringe part is created by extending the beading beyond one edge of the loom work. Therefore both the loom and off loom parts are carried out together. The loom work acts as the foundation. It is a simple idea but one which has a lot of potential. Play with different color schemes, change up the bead sizes and even types. DIY Bead Loom Eliminates Many Thread Ends! Really fascinating. Never thought of doing that. Neither do most of us! I certainly didn't think of it. This is worth a try!